Acclaimed Chinese concert pianist Lang Lang said he wanted to bring Chinese music to the 2014 FIFA World Cup in Brazil as a personal gift to celebrate the sporting event. LL performed several works at HSBC Arena in Rio de Janeiro concert organized by the Brazilian government and Spanish tenor Placido Domingo.including. He played Tico Tico in his set, one of the official songs of the 2014 FIFA World Cup, in front of thousands of people. 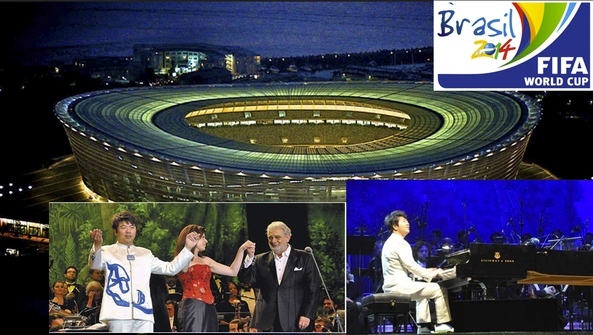 "I performed with Domingo at the 2006 FIFA World Cup kickoff celebration concert in Germany, but I did not have the chance to play a Chinese song then," said Lang, "so I managed to include the Spring Festival Overture into the list to add some Chinese elements into it." A native of Liao-ning province this marks the third time that LL has visited Rio de Janeiro. Now 32 years old, he has played with leading orchestras in Europe, the United States and China. He gave his first public performance at age 5 and won first prize for outstanding artistic performance at the fourth international competition for Young Pianists in Ettlingen, Germany, in 1994.